Cameron Rucker led Northmont with 22 points at Franklin. FRANKLIN — Northmont’s boys basketball team invaded Lebanon on Friday and suffered its second loss of the season to the Warriors. The Thunderbolts fell 61-46, which was a nearly identical score to the 60-46 loss suffered at home to the Warriors during the third game of the season 60-46 on Dec. 8. Friday at Lebanon the Thunderbolts trailed by five after the first quarter and by six at halftime, 28-22. The Warriors took control of the game in the third quarter by outscoring the Thunderbolts 20-9. 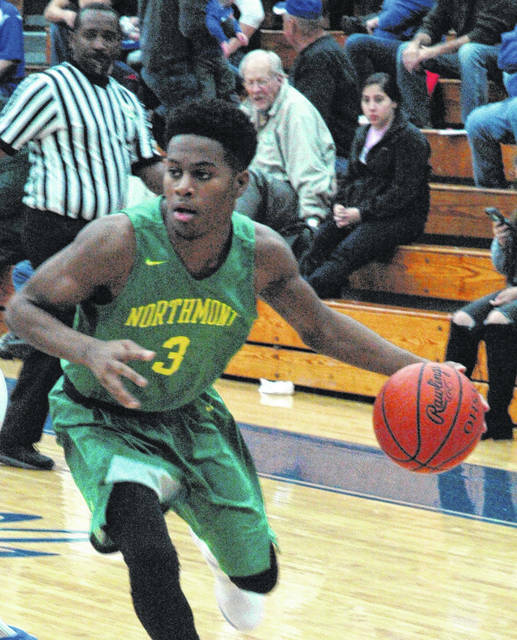 Senior guard Jabari Perkins led Northmont with 13 points including a trio of 3-point goals. Northmont shot a dismal 39.6 percent from the field (19-48) and only 36.4 percent from the foul line (4-11). Lebanon had three players score in double figures. Harrison Hookfin had a double-double with 14 points and 10 rebounds. Drew Sekerak also scored 14 points while Zach Huffman tossed in 10. With the loss Northmont fell to 6-10 overall and 1-7 in conference play. Lebanon improved to 13-5 overall and 4-5 in conference play. Miamisburg remains in first play in the National West division of the Greater Western Ohio Conference at 14-4 overall and 4-4 in conference play. Saturday the Thunderbolts headed south once again for a game against non-conference opponent Franklin, which is in first place in the Southwestern Division of the Southwestern Buckeye League. The Thunderbolts posted a 56-51 victory to hand Franklin only its fourth loss of the season. Northmont led 21-17 after the first quarter and 35-27 at the half. The third quarter turned into a defensive battle with the two teams scoring a combined 12 points. Franklin outscored Northmont 19-14 in the final period but the Thunderbolts managed to hang-on for the five point victory. Cameron Rucker hit nine of twelve shots from the field including 4-5 from 3-point range to pace Northmont with 22 points. Freshman guard Prophet Johnson had a big night with 15 points and nine rebounds. Senior guard Jared Kinzer led the Wildcats with 14 points and nine rebounds. Northmont shot 50 percent from the field and 52 percent at the free throw line. Franklin also shot 50 percent from the field, but only managed to score nine of 28 shots from 3-point range and shot a sub-par 37.5 from the foul line (6-16). The Thunderbolts play another road game against division rival Springboro (4-13) on Friday before hosting non-conference opponent Bellefontaine on Saturday. Prior to the Bellefontaine game longtime basketball announcer, the late Loren James, will be honored. Tuesday, Feb. 13 the Thunderbolts will travel to Bethel to face the Bees. Northmont: Dawson Walker 1-0-2, Jabari Perkins 1-4-6, Ryan Foy 0-1-1, Jamaal Linson 0-1-1, Prophet Johnson 4-5-15, Donavin Wallace 1-1-3, Cameron Rucker 9-0-22, Kameron Mathis 1-0-2, Danny Lewis 2-0-4. Totals: 19-12-56. Franklin: Cole Bundren 3-0-8, Braden Hall 3-1-7, Jared Kinzer 4-5-14, Payton Knott 1-0-3, Zach Minton 2-0-6, Will Emrick 1-0-3, Jayden Fitts 1-0-2, Ryan Russell 2-0-6. Totals: 16-6-51. 3-point goals: Northmont 6 (Rucker 4, Johnson 2); Franklin 9 (Bundren 2, Minton 2, Russell 2, Kinzer, Knott, Fitts). Records: Northmont 7-10, Franklin 15-4.